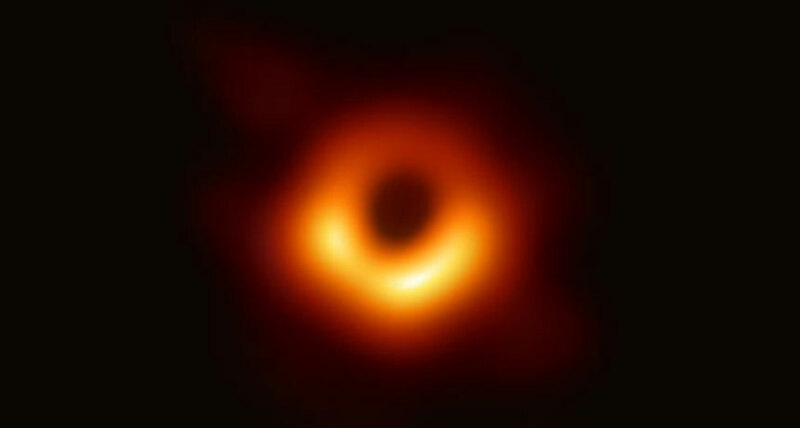 The NANOGrav Collaboration congratulates the Event Horizon Telescope team for their success in creating a spectacular first direct image of the supermassive black hole at the center of galaxy M87. This measurement represents the culmination of a 10-year effort and a number of technological and scientific advancements, not least of which is the proof that supermassive black holes of millions to billions of times the mass of the sun are in fact the engines of intense gravity and light in the centers of many galaxies. For years astronomers have seen the “smoking gun” from these compact titans in the form of large-scale radio jets and intensely glowing X-rays, but the EHT result has delivered the first direct image of the heart of one of these objects. NANOGrav is involved in a long-standing effort to directly detect not just one, but two supermassive black holes in a tight orbit. This detection will be made not through their light, but through the effect of their gravitational waves on radio pulses from celestial clocks called pulsars. But what would two black holes look like? Well, NANOGrav is seeking gravitational waves — subtle perturbations in space-time that appear when a very massive object, like a supermassive black hole, is accelerated. We don’t expect to see bright gravitational waves from a single supermassive black hole, but when galaxies merge, two supermassive black holes can meet and begin a roughly billion-year waltz as they orbit, inspiral and eventually coalesce with one another. During their inspiral, they are constantly accelerating and will produce some of the brightest expected gravitational waves in the Universe. Seeing gravitational waves will be an amazing feat, and will be enhanced multifold by the detection of light from those self-same systems: a “multi-messenger detection”. M87 has long been suggested to be a binary (rather than single) supermassive black hole, although the EHT refutes that idea; if it were two black holes, we would have seen a distorted event horizon or even two rings, rather than the near-perfect annular structure seen in the EHT image. While most of NANOGrav’s expected targets will not be nearby enough to resolve the two event horizons in the way EHT did, we can and will be looking for the signatures of binary motion from large-scale tracers of outflows from the black holes: periodically varying light, wobbling jet axes, double jets, moving emission lines that track the black holes’ orbits, and many other exciting signatures! 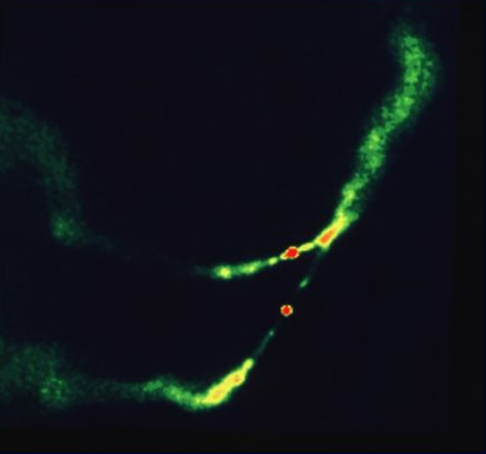 3C75: In this radio image, two supermassive black hole engines are seen as red dots; their large-scale jet structures are clearly visible. 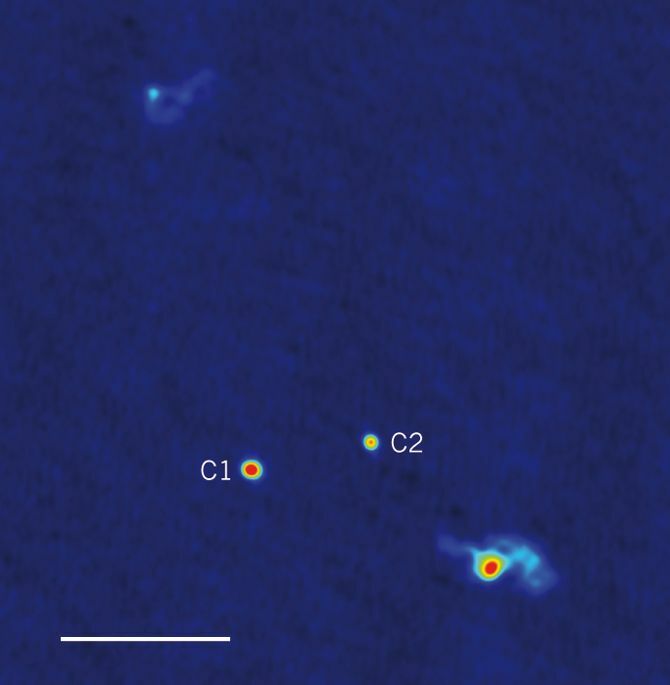 0402+379: In this radio image, two compact radio cores (which coincide with the location of separate supermassive black holes) are marked C1 and C2. The scale bar shown represents 10 parsecs. This represents the smallest-orbit supermassive black hole pair whose light has yet been imaged. OJ287: This object has been giving off periodic flares approximately every 12 years for the last ~100 years, as shown in the historical astronomical data here. It is thought to represent a binary supermassive black hole that is actually emitting in the gravitational-wave band. OJ287 is a potential target for EHT observation; with its superb resolution, EHT might be able to resolve the base of two separate jet systems from two separate black holes in this object.